All-Included-Growing-Kit. Just Open…then water…watch it grow!!! Additionally, send flowers anywhere in the world with Magic Flowers. Anyone can enjoy springtime with Magic Flowers growing kits. Enjoy the beauty of the season and also have fun growing Magic Flowers. Additionally, spring will always be in the air and in your heart as the bright and vibrant colors blossom! Pick from our large selection of flowers. 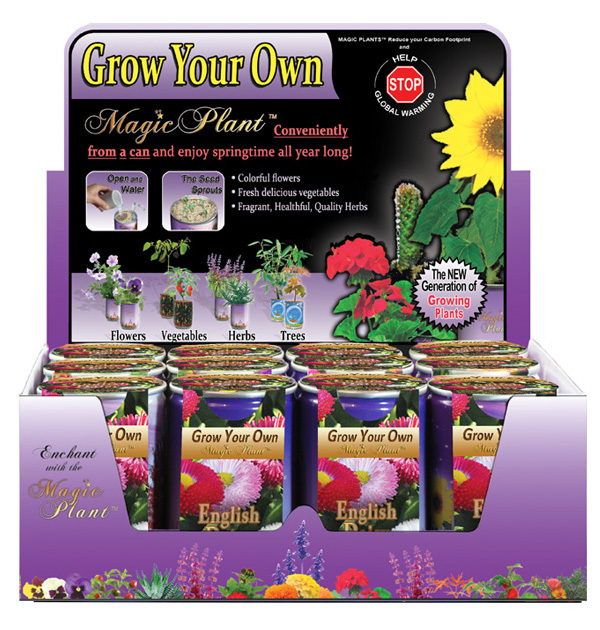 Each Magic Flower container comes with seeds pre-planted in special mineral soil. Simply water and follow directions to enjoy colorful flowers any time of the year. 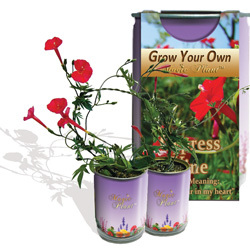 Buy Cypress Vine flowers growing kits available both retail and wholesale. Also, provide sufficient light during the budding period. As a result, flowers form in 4-6 weeks. Once buds begin to form, move indoors for enjoyment. However, keep one healthy bud in the pot for cultivation. In the meantime, the rest can be planted elsewhere. 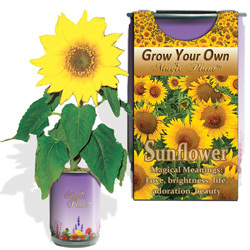 Buy Sunflower growing kits both retail and wholesale. Ideal temperatures for flowers growing kits are between 59-95 F (15-35 C). First and foremost, provide sufficient light during the budding period. Move indoors once buds begin to form. Leave one healthy bud in the pot for cultivation. Also plant the rest other places. Magical Meaning: Thoughts of absent friends, lasting affection, constancy, goodness, and daily remembrance. 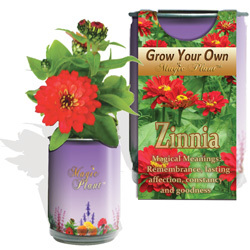 Buy Zinnia (Elegans) flowers growing kits available both retail and wholesale. When buds first begin to form, move the plant indoors where for enjoyment. Be sure to provide adequate light once the plant starts budding. Keep a healthy baby bud in the pot to cultivate. Ultimately, plant the rest around your home. They can be give to freinds also. Magical Meaning: Possess wealth, glory, passion, and creativity. 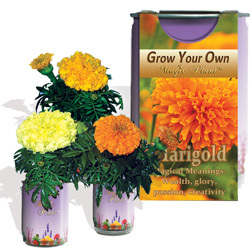 Buy Marigold growing kits both retail and wholesale. Flowers form in about 11-12 weeks. Take the center bud off when the plant reaches to 4 inches /10 cm high to stimulate growth. Magical Meaning: Purity, innocence, loyal love, beauty, patience, and simplicity. 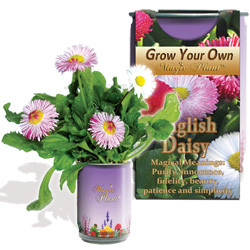 Buy English daisy (Bellis) growing kit retail and wholesale. Flowers begin to form in 12-16 weeks. When flowers begin to form, it can be moved to indoors for enjoyment. 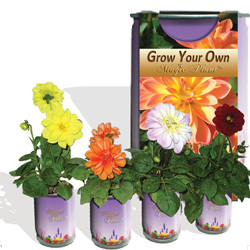 Buy Dahlia flowers growing kits both retail and wholesale. Ideal temperatures for growing are 59-86 F (15-30 C). Grow your own Strawberry plant. Buy Strawberry growing kit retail and wholesale. Ideal temperatures for growing are 59-77 F (15-25 C). Buy Pansy growing kit retail and wholesale. Ideal temperatures for growing are 67-77 F (18-24 C). Magical Meaning : Your presence soothes me. Buy Morning Glory growing kit retail and wholesale. Ideal temperatures for growing are 68-86 F (20-28 C). Growth appears in about 5-10 days. Magical Meaning : Simple, natural, pure and understanding. Buy Geranium flowers growing kits both retail and wholesale. Magical Meaning: Modesty, virtue, affection, watchfulness, faithfulness, loving and let’s take a chance on happiness. Buy Violet (Viola) flowers growing kits both retail and wholesale. Magical Meaning : Grandeur, warmth, and affection. Symbolism: fortitude, fearlessness, and self-belief. Buy Cactus flowers growing kits both retail and wholesale. Ideal temperatures for growing are 77-95 F (25-35 C). Magical Meaning: Confession of Love. Flowers form in about 6-8 weeks. Magical Meaning: Pray for me and bring me sensibility or wisdom. Magical Meaning: “Never fade or change love” . Keep 1 healthy bud in the pot for cultivation. When buds begin to form then, move the plant indoors for enjoyment. To stimulate growth, take the center bud off twice when the plant reaches 10 cm high. In addition, it requires sufficient light. Also, avoid long exposure to humidity. Ideal temperatures for growing: 68-95 F (20-35 C). Additionally, flowers form in about 14-15 weeks. When buds form, then move the plant inside. Finally, plant the remaining flowers elsewhere. However, the plant needs 50% light before growth appears. Forget-me-not flowers appear in 16-20 weeks. Needs abundant light in addition to watering once each day after growth appears. Also, transplant to a larger pot or plant directly in the ground. Plants ultimately reach 10 to 20cm tall. Also, may bear single or double petals. Petal Colors vary but are bright, beautiful and perpetual. Additionally, the plant gives off an elegant scent. Ideal temperatures for growing are between 59-86 F (15-30 C). However, when buds form, move inside. Also, when plant height reaches 6-8 cm, leave one bud in the pot for cultivation. Actually, the Dianthus plant prefers cooler environments. Therefore, avoid high temperatures and humidity, but provide adequate light. In addition, to stimulate growth, remove center bud when the plant reaches 10 cm tall. Magical Meaning: beauty and innocence. Ideal growing temperatures: 59-77 F (15-25 C). Also, flowers form between 12 and15 weeks. As buds form, then, move indoors. Additionally, keep 1 bud in the pot for cultivation. Then, plant the rest elsewhere. Ideal growing temperatures 59-77 F (15-25 C). Ultimately, growth appears in 14-20 days. Additionally, flowers form in 16-18 weeks. When buds begin to form, move indoors. Also, keep 1 healthy bud for cultivation. Then, plant other buds elsewhere.